The ideal ‘fuels’ for our bodies are the slow-burning, low calorie foods which provide energy steadily and gradually. Our best sources for this energy are complex carbohydrates found mainly in plant foods like fresh fruits and vegetables, whole grains, and legumes or pulses. Simple carbohydrates, which we can overload on in snacks like refined breads, pasta, cakes and biscuits give an explosion of energy; but it is very short lived and we soon feel hungry again. This easy to prepare recipe makes a satisfying lunch with chunky grain bread and some crispy crudités. It has a low calorie count of 180 per serving. 1tsp fresh thyme; salt and freshly ground black pepper; parsley for garnish. Combine the beans and rinse in a colander under cold running water. Peel and crush, or finely chop, the garlic. Put it in a food processor with the beans, tahini paste, lemon juice, parsley and thyme. Season the pureed mixture with salt and pepper. Process again until creamy, adding 2 or 3 tablespoons of hot (boiled) water. Serve garnished with parsley sprigs and accompanied by crusty wholemeal bread and raw vegetables such as radishes, celery, carrots and cauliflower florets. 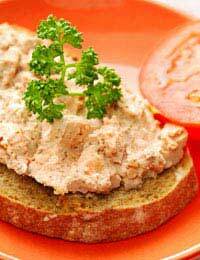 The pate can be made a day in advance and stored in the fridge; or frozen for up to a month. This healthy recipe is a complete low calorie meal, high in fibre and protein, and only 455 calories per serving. Preheat oven to Gas mark 4 (180 degrees Celsius). 4 skinless chicken breasts; 115 grams tinned butter beans; 1 medium onion; 450 ml chicken stock; 1 pinch saffron (optional); 225 grams carrots; 175 grams leeks; 2 tsp fresh thyme and parsley (1 tsp dried ); salt and freshly ground black pepper; 2 tsp snipped chives. Topping - 350 grams sweet potatoes; 350 grams ordinary potatoes; quarter pint semi-skimmed milk; pinch cinnamon. Peel and slice the onion. Pour chicken stock into a pan and add onion and saffron. Bring to the boil, reduce the heat and simmer briskly, uncovered, for 15 minutes. Meanwhile, slice carrots and leeks into regular sized rounds. In a 2 pint, flat, ovenproof dish, layer the chicken breasts with thyme, parsley, carrots and leeks. Pour over the saffron and onion stock. Season with salt and freshly ground black pepper. Cover and cook in the oven for 40 minutes, stirring halfway through. Meanwhile peel and cut the sweet potatoes into rounds about 25mm thick. Cook in boiling water for 15 minutes until soft. Drain and mash thoroughly, adding half the milk and the cinnamon.Peel and cut ordinary potatoes into similar sized chunks and cook in boiling water for 15-20 minutes. Drain, add remaining milk and mash thoroughly. When casserole is cooked, remove the lid and stir in butter beans. Cover with mashed sweet potatoes and white potatoes in alternate stripes. Return to the oven and bake a further 40 minutes until topping is lightly crisp and golden. Garnish with chives and serve immediately. This tasty dish is made with healthy, high fibre food and has a low calorie count of 350 per serving. Preheat the oven to Gas mark 5 (190 degrees Celsius). 4 medium peppers, mixed colours; 175 grams short grain rice; 1 large onion; 1 clove garlic; 3 tbsp olive oil; 2 tbsp pine nuts; 1 tbsp currants; 75 grams dried apricots chopped; half teaspoon ground cinnamon; salt and freshly ground black pepper; 2 tsp sugar; 2 tbsp chopped parsley; 2 tbsp chopped mint; 2 medium tomatoes; 1 tbsp tomato puree; 5 spring onions. Cut a small slice off the stem end of each pepper and set aside. Remove cores and seeds. Wash the rice and drain thoroughly. Chop the onion finely. Crush the garlic. Bring 450ml of water to the boil. In a separate, large saucepan fry the onion with the oil on medium heat for 5 minutes until golden. Add pine nuts and fry another 3 minutes. Stir in the rice. Add currants, dried apricots, ground cinnamon and seasonings. Stir in the boiling water and add sugar, parsley, mint, tomatoes, tomato puree, crushed garlic and spring onions. Mix well and cover. Cook for 10 minutes, leaving the rice slightly underdone.Remove from the heat and spoon the mixture into the peppers. Cover with reserved tops and place peppers upright in an ovenproof dish. Pour 150 ml of cold water around them. Cover with a lid or foil and bake for 40 minutes. Uncover and bake for 20 minutes more. Serve hot or cold.